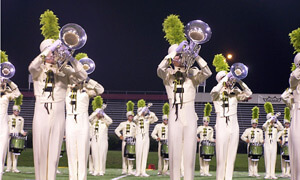 Carolina Crown emerged victorious at Friday's DCI Central Illinois event, earning a higher score than The Cavaliers for the first time in the corps' 20-year history. With a score of 77.50, Carolina Crown surpassed the Cavaliers' 77.10 by a few tenths of a point. Carolina Crown Program Coordinator Jim Coates said he was surprised with the night's outcome to some degree, but happy that their hard work and unique sound was recognized. "We have a great program, the design team put a fabulous program together, and the kids are really enjoying it. Certainly the crowd was right with them tonight and that pushed the kids to the emotional difference in here. I think it came through on the effect sheets and the effect scores, especially music," he said. 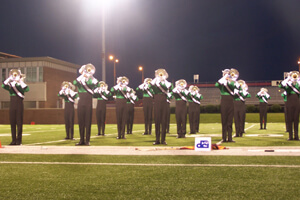 Alex Harmon, drum major for the Cavaliers, said his corps' performance was "amazing." "The guys have such great emotion, and I haven't seen that in a very long time from the Cavaliers. It's a very special group and a very special group to have the opportunity to lead," Harmon said. "It's early in the season," he said about the outcome of the competition. "We're just going to continue to do our thing. We're going to continue to design and produce our show, and whatever the outcome is, it's never been important to the Cavaliers." Earning third place was Phantom Regiment (76.30), followed by the Blue Stars (70.30), Boston Crusaders (70.1) and Glassmen (67.5). Colts and Spirit rounded out the competition with scores of 65.60 and 64.50, respectively. Hundreds of screaming high school students were among the fans packed into Illinois State's Hancock Stadium at the event—and some of them even had the opportunity to join the corps on the field. The show was presented as part of Bands of America's Music for All Summer Symposium, a week of educational programs and exciting performances for students. 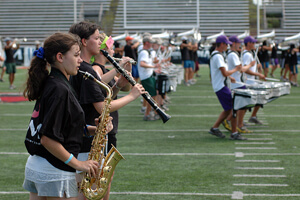 The highlight of the week for many was the opportunity to share the field with Carolina Crown for the event's encore. One hundred high school marching band members worked with Crown to learn part of the music of the corps' 2009 program, "The Grass is Always Greener," as well as a portion of the visual program.